A special diet for Parkinson disease will support your treatment and help you find ways to improve your quality of life. Parkinson disease patients must cope with the side effects of their medications as well as the effects of this neurological disorder. Your diet may prove beneficial on both fronts. Parkinson disease affects your nervous system, causing a deterioration of neurons or nerve cells. The destruction of neurons impacts your motor abilities. There is no cure for the disease, however, patients can benefit from the medications which are available for treating the symptoms of this disorder. As with any medication, there is a risk of side effects. One side effect which Parkinson disease patients may encounter is nausea caused by medications for treating the condition. One medication often prescribed is levodopa. Levodopa should be taken before you eat, though some people may experience nausea when it is taken on an empty stomach. Your special diet for Parkinson disease can help relieve or prevent your discomfort through shifts in how you eat. One way you can do this is to avoid dietary triggers which may bring on nausea. Your diet therefore, will be low in fat since heavy foods may trigger an attack. You may also avoid nausea if you break your eating down into smaller, frequent meals throughout the day. Among the complications of Parkinson disease are weight loss and malnutrition. The tremors associated with this condition burn calories whether intentional or not. As a result, you may lose weight. Nausea combined with depression over the disease may cause you to lose your appetite. Good nutrition, therefore, becomes more important than ever if you are not eating as much as you should. Your diet should focus on high quality food items which deliver the proper mix of vitamins and minerals. The basics of healthy eating will give your special diet for Parkinson disease a solid foundation. Your snacks should be high in calories and nutritional value. Avoid empty calories such as sweets and soft drinks to maximize your calorie intake. Along with your food's nutritional value, you should monitor how much protein you eat. Novartis Pharmaceuticals Corporation recommends avoiding a diet high in protein which may interfere with your body's ability to absorb levodopa. A healthy basis for your diet might be to follow the Mediterranean Diet. The diet is rich in omega-3 fatty acids which will support proper neurological function. A 2009 study in the journal, Movement Disorders (v. 24, pg. 1881-1892), recommends the Mediterranean Diet as a way to support your medical treatment. Omega-3 fatty acids may also increase the amount of dopamine in your brain and central nervous system. Low levels of dopamine have been associated with Parkinson disease. As with any diet, you should drink plenty of fluids to aid digestion and for relieving thirst and dry mouth sometimes associated with Parkinson disease medications. Conversely, you should limit caffeine-containing beverages which can act as diuretics and counter the benefit of fluids in your diet. Other dietary changes can provide further support for your condition as well as possible ways to slow its progression. A 2009 study in the Journal of Neurochemistry (v. 109, pg. 1427-1439) found that co-enzyme Q-10 could help improve impaired motor performance associated with Parkinson disease. You can take a nutritional supplement or get adequate amounts of co-enzyme Q-10 in your diet. Sources include fish, meat, and eggs. You can also get this important nutrient by including spinach and broccoli in your diet. 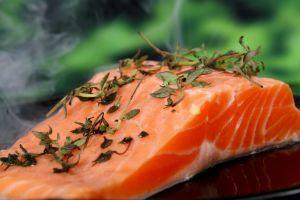 Eating fish will also provide you with a dietary source of omega-3 fatty acids. The information regarding Parkinson disease is that diets for health conditions can help patients live a normal life. A healthy diet with adequate amounts of the nutrients which may further relieve symptoms can supplement traditional medical treatment and help you gain control over your life.